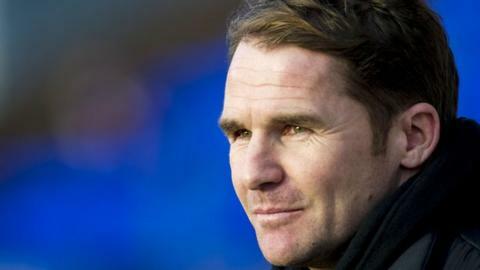 Partick Thistle manager Alan Archibald is keen to scupper Dundee United's Premiership survival attempts in order to maintain the Jags' top-six hopes. Eighth-placed Thistle host bottom club United at Firhill on Tuesday evening and the Tangerines can move to within two points of Kilmarnock with a win. "All the media are enjoying United's comeback story but we've got something to fight for as well," said Archibald. "We've got that incentive to get into the top six." United beat St Johnstone on Saturday while Thistle drew 0-0 with Killie, leaving Archibald's side two points off sixth-placed Dundee. Archibald was a centre-back for United for four years but insists there is no room for sympathy towards his former club. "It could be us and I don't think anybody would feel sorry for us," said Archibald. "I said if they can get within touching distance then they'll give themselves a chance and they've done that." Dundee United have already made an approach to sign Jags midfielder Steven Lawless at the end of the season - with Inverness Caledonian Thistle also interested in the 24-year-old - but Archibald has no qualms playing him against United. "Not at all, Stevie's our player," added the Jags boss. "I think with certain players these things can happen - it can sway their minds and affect their performances. "But, since January, Stevie's actually got better so we've got no concerns at all about playing him." Meanwhile, Archibald believes if Monday's rainy weather subsides by Tuesday morning, there should not be a problem with the game going ahead on a Firhill surface that has struggled in wet conditions so far this season. Dundee United boss Mixu Paatelainen expects conditiosn to "play a role" and added: "Not every surface is immaculate at this time of year. "You get on with it, it's no problem at all. It's the same for both teams. Partick Thistle are a passing team and if the surface is not immaculate, they suffer. "I know their ground staff will do everything to make sure conditions are as good as possible."